The story begins at Belmont, at the 2004 Belmont Stakes. Lois Engel and her husband, Paul Raymond, were there with 120,137 other racing fans, wondering whether Smarty Jones would become the first horse in 25 years to win the Triple Crown. It was their first trip to the Belmont. Racing history aside, Paul was looking for a winner, and he thought that he found one in Birdstone. Belmont’s big, but even its massive plant had a hard time handling 120,000 people, and the betting lines were so long that Paul got shut out. He watched as Triple Crown hopes failed in the stretch, and as his 36 – 1 shot crossed the wire first, unencumbered by the weight of a dime of his money. Paul and Lois had bought their first broodmare for their Pucker Ridge Farm in 2003, and, trying to make up to Paul for that wager that didn’t get made, Lois called Gainesway immediately when stud plans for Birdstone were announced. Along with such racing luminaries as Mine That Bird and Summer Bird, their colt was part of Birdstone’s first crop of foals. They had planned to sell him in Saratoga as a yearling, but the “ugly” colt wasn’t accepted to the sale, so Lois and Paul decided to keep him and race him themselves. The farm is Lois’s baby; Paul doesn’t get too involved, but this horse became his pride and joy. Lois and Paul live on Long Island, and their farm is upstate, not far from Lake George. They’ve long been supporters of the Double H Ranch, which shares a connection with the nearby Great Escape amusement park. The park, originally known as Storytown, was founded in 1954 by Charles R. Wood; in 1993, Wood joined forces with Paul Newman, founder of the Hole in the Wall Gang camps for critically ill children, to establish the Double H Ranch, a Hole in the Wall Gang camp, in Lake Luzerne, New York. Owning a horse farm is an expensive endeavor, and one year, when finances were tighter than usual, Lois and Paul looked for a way to continue their support of Double H Ranch. They donated a package to the auction at the Great Escape fundraiser; the package included tickets to the races at Saratoga, a stallion breeding, the lease of a broodmare, and the rights to name a horse. Charlene Wood, Charles R. Wood’s daughter, was top bidder. Wood had died in 2004 at the age of 90, and in honor of her father, Charlene named the colt Pappy’s Double H. According to Lois, “Charlene called her father Pappy, and he always said that if you have health and happiness, you have everything. That’s how the ranch got its name, and that’s how Pappy’s Double H was named.” A portion of the colt’s earnings were pledged to the camp. Pappy didn’t immediately take to racing; he was well-beaten in his first two starts, and he didn’t look like a winner in the last race on Saturday, October 3rd, Jockey Gold Cup day at Belmont. No doubt, Lois and Paul, and their trainer David Prine, were disappointed. But disappointment turned to horror when they watched their Birdstone baby fall gruesomely, forward and over; his jockey, Jesiere Medina, managed to avoid the horse landing on her and crawled under the rail to safety. Pappy shuddered in the mud and lay still; nearby, Medina got up. She was OK; he wasn’t. “We—Paul and our trainer, David Prine–spent a good portion of the evening at North Shore Hospital with Jesiere Medina. She has a broken collarbone and was in a tremendous amount of pain. Thankfully, her injuries were not worse. The poor thing was scared and upset over Pappy.” Medina will be out for two months. Lois bred Pappy as a gift to her husband, as a way of taking the sting out of that unplayed Birdstone ticket. 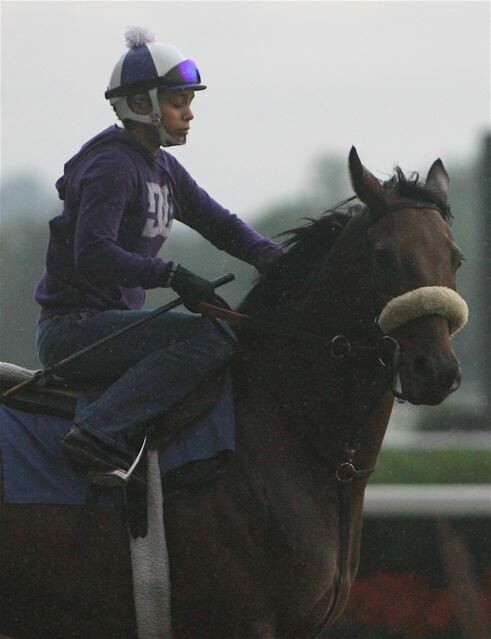 Following the colt’s death, she thought of David Prine, her grieving trainer, and as she did in 2004, she made a phone call. 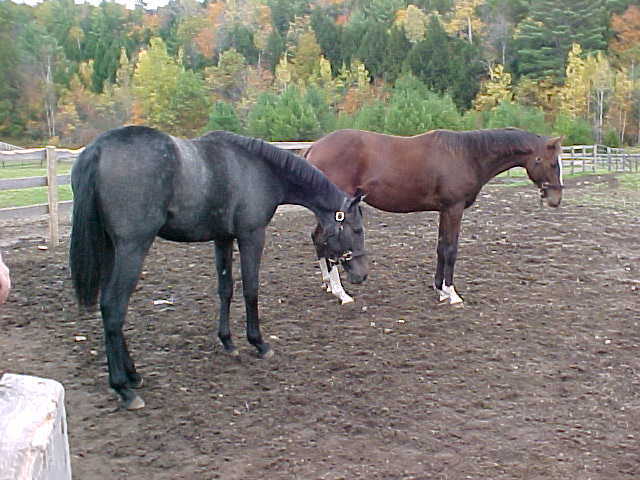 Last year, a gray colt born in 2008 lived at Lois and Paul’s Pucker Ridge Farm; the Macho Uno baby was “orphaned” when his dam tried to kill him, and Prine had worked to assimilate him with the other weanlings. According to Lois, the little guy thinks he’s a pet and is “incredibly socialized” because he’s always been around people. Prine had always liked the colt and Lois had considered buying him, but he was too expensive, and last October, his owner moved him back to Kentucky. The new horse arrived this week, and Lois has submitted his name to the Jockey Club: Cypress Hills, for the neighborhood where David grew up in Brooklyn. The story of Pappy’s Double H began on a big race day at Belmont, when Birdstone captured the attention and imagination of the racing world; five years later, it ended on a big race day at Belmont, not long after a son of Birdstone made history by adding the Jockey Club Gold Cup to victories in the Travers and the Belmont. Pappy’s legacy lacks the glory of his storied relatives, but to his connections, he was as important as any Grade I winner. They bred him, they owned him, they raced him, and they were there when he died. And like most people who love horses and who love racing, they know that despite their loss and despite their grief, they need to carry on: they have jobs outside of the racing industry, as well as a farm to run. And like most people who love horses and who love racing, they look to the next generation for solace. They know that their new gray colt won’t take Pappy’s place, but he might, as Pappy himself did, for Paul and for Lois, for Charlene Wood and for the children of the Double H Ranch, turn a bad memory into one of hope. The photos of Pappy’s Double H and Jesiere Medina were taken by Joel Silva. The photo of the Macho Uno colt was taken by Lois Engel. This is a lovely, incredible story. You definitely have a way with words. I was devastated when I head about Pappy's death. This is such a lovely next chapter. Pappy lives on!" Thank you, Linda. The story told itself, really.Charlene: thank you so much for stopping by–I'm sorry for your loss. We'll all look forward to seeing how the gray guy does! What a tremendous story. As a huge fan of Lois, Paul & the whole Pucker Ridge Gang it was even more devastating to be at Belmont that Saturday late afternoon. One minute they're stopping bye to wish us luck with Macho Again and a half hour later we're all sitting helpless, wishing there was some way to run out and comfort them. What you captured so brilliantly in your article is the love and care that Lois, Paul, and David have for their animals. Anyone who's visited their operation sees it first hand. Hopefully the next horse they lead over will result in "One for the GOOD GUYS…"
You have provided beautiful details to a very sad story and I'm grateful for your words. Thank you. I was at Belmont on Oct. 3 and walking to the train when I saw the crowd at the rail. I asked which horse and I immediately looked in my program to learn more about him. I saw that Pappy's Double H was a son of Birdstone and was very sad to think how different his day ended to his half-brother. I looked for more details in the papers but didn't see much. Thank you for providing his wonderful story and my heart goes out to all his connections. Tommy: Thank you. I'm hoping to have the chance to tell more of their story in an upcoming article. And not sure whether you saw it, but last summer, I was fortunate to a write a piece for the Saratogian on Macho Again’s owners. What fun it was, and to see them at Belmont for the Gold Cup.Celeste–thank you. Kirsten–I know that Lois and Paul appreciated all the kind words and interest in their colt. Thanks for reading and leaving a comment. This is perfect Teresa. Thanks for sharing this. Lynne and CG: Thank you.